Having finally re-discovered my wild boar research in one of my client’s files, I’ve decided to make this a two part blog. The first part deals with the real animal, while part two will explore the mythological beasty. 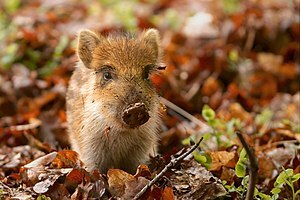 Growing up in rural Germany, I often came across wild boar, when walking in the woods or when visiting nature reserves. It was always thrilling to meet this shy, but potentially lethal creature. Most of them take to their heels and run off, but some stand their ground and challenge the astonished hiker, particularly when their chocolate and cream striped and utterly adorable piglets are accompanying them on their foraging trips. The wild boar (Sus scrofa), or wild pig, is a species belonging to the pig genus Sus, which forms part of the family Suidae. 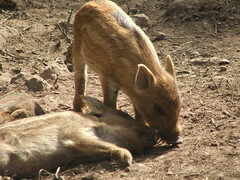 Wild boars are the ancestors of our domestic pigs and typically live in groups of 20 to 50 animals. Northern and Central Europe was once their main stomping ground, but their geographical spread also includes the North African Atlas Mountains, large parts of Asia and the Mediterranean, too. Their average weight is around 44 to 50 kilos, but some male boars can reach enormous sizes: 320 kg boars were allegedly strutting around in Russia, but 100 kilo specimen are not uncommon in Italy either. Fancy coming across that on a walk! 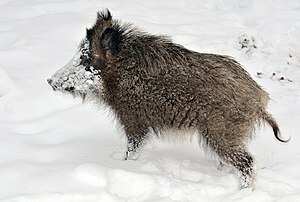 While in Germany the wild boar is still common and indeed, is now invading cities to forage for food (e.g. March 2012, Hamburg, where a wild boar fell into a river, when a group of wild pigs where chased from people’s gardens), the relentless hunting caused the wild boar to disappear completely from British forests and fields during the Middle Ages. Today, wild boar – its own worst enemy, thanks to its delicious meat – is being commercially farmed in the UK, but a few small colonies exist in the wild, mainly where wild boar managed to escape from farms and wildlife parks. One small herd established itself in Dorset; the other exists in East Sussex/Kent. Throughout the centuries wild boar was prized not just for its wonderful meat but also for its bristles, which were used for brushes and for its ivory tusks, which can be cut into all manner of things and be decorated with carvings. Famous for its bravery, the wild boar is a formidable opponent. Hunting for boar and stag became particularly popular among the European aristocracy in the 14th century, when knights and their kings owned vast estates. They established their own game parks to allow them total control over their hunting grounds and prey. The aristocracy put very strict laws into place to protect their animals throughout the seasons, ensuring there’d always be enough meat on their princely banqueting tables. Hunting was a pastime for the elite, leaving foxhunting to peasants. The nobleman Gaston Phoebus published a whole series of hunting scenes in Burgundy, which show how the rich elite hunted with lots of underlings doing the chasing and flushing out of prey as well as packs of hounds, nets and snares to kill wild animals. To give Gaston his proper titles, he was Gaston III/X of Foix-Béarn, also known as Gaston Fébus or Gaston Phoebus (April 30, 1331–1391). For his sins he was the 11th count of Foix as well as viscount of Béarn (1343–1391). Officially, he was known as Gaston III of Foix and Gaston X of Béarn. His book Livre de chasse (Book of the Hunt) was written between 1387 and 1388 and dedicated to Philip the Bold, who was the Duke of Burgundy at the time. As one of the greatest huntsmen of his day, Gaston III/X knew what he was talking about. He describes the various stages of hunting and how to hunt for different animals. As a self-appointed expert on animal behaviour Gaston also offers advice to the less well-off aristocracy, who often bankrupted themselves by keeping game parks and inviting vast numbers of their mates to hunt with them – they all had to be accommodated, fed and watered! Gaston’s hunting scenes were also reflected in the rich tapestries of the time, which served as wall hangings in castles to keep out the draft and to boast to visitors of the riches the castle owner had at his disposal, not to mention his prowess as a hunter. One of Master Phoebus’ paintings shows a boar hunt, where the rich overlord is sitting safely on a horse, piercing the wild boar with his broad sword, while his underlings are armed with lances and spears, risking their own lives by confronting the boar on foot. Together the collection of paintings appeared in what was to become one of the most famous hunting books of the time. If this blog was about cooking for humans, I’d now present you with a yummy wild boar recipe, but just like Willow the Vampire’s attitude in these matters, my own allegiance is with the boar, I’m afraid! I do confess to having eaten wild boar stew on a number of occasions when I was young and out for a meal with my parents and well…it was very delicious indeed. The next blog will deal with the boar as a mythical creature, both hunted and revered for millennia by Phoenicians, ancient Romans and 6th century Celts, or should I say Brits, like King Arthur and Merlin. I like wild boars, I don’t mean to eat, I mean to watch – I am strangely drawn to them for some reason – I don’t know what it is. Please keep up with this Medieval history – I love it. I’m using Cardiff University library at the moment, it’s so nice and quiet and they’ve got so many wonderful books on ancient and medieval history. A “glutton’s paradise”! Glad you like wild boars as “people” (in contrast to on a plate), they have their own peculiar charm, rustic and yes, medieval. The library sounds fantastic – totally jealous. Yes, I do like wild boars – I don’t think that there is enough out about them. I’ll be posting some more stuff about wild piggies, don’t you fret. They’ll be a great addition to Willow the Vampire’s army of formidable friends! It’s been so quiet in the library this week – apart from me sneezing all the time. The loverley Venetian F. left for London last weekend and as a parting gift she gave me her nasty cold. Sniff. Am better now, but only just. Horrible bug, i’ve given it to the poor librarian – and as a result the library closed today at 5pm instead of 9.30 pm! No temporary cover for her available. F. should be ashamed of herself, hehe. Yes do write about the wild boars, also if you can get some drawings and pictures on because I like looking at them – this sounds really stupid because a sense of something good emanates from their pictures. I shall look forward to that. I hope you are feeling better – I think summer colds are worse than winter ones – they don’t seem to go away and they make our heads feel like they are going to burst because of the heat and pollen. I hope that both the librarian and yourself have clear nostrils now. I thought of you yesterday whilst in Stratford Upon Avon on the antique market. No! No! I’m not saying that you are an antique. Will has got a LAMDA exam coming up and for one of his pieces, he had chosen a monologue from Goethe’s Faust. We got a copy of part 2 on the antique market yesterday for £3. So I said to Will that you would be pleased about that. We will start studying it probably next week. I am so behind with reading blogs – I have got 500 unread emails in my in loony in box. Big hugs. I’ll try to find some pleasing wild boar pics for you! Had to stop reading blogs for the time being, because of flatmate crisis and too much work. Will start on the huge backlog later this week. Glad to hear Will’s tackling Goethe’s Faust. I nearly went into Goethe’s fav pub in Leibzig where rumour has it, Mephisto met Faust…over a tankard of beer, while Goethe and his pals were discussing them…Have forgotten the name, but it’s a really famous Bierkeller (meaning pub in the basement). Will catch up with you soon properly – the Dr Who exhibition is going well; went past there a few days ago and the theme tune was blaring away, kids, dads and teens were coming out laden with goodies like t-shirts (really cool) and posters and stuff. Just warning the two of you – Will needs to save up his pocket money before he comes to visit, there are so many great goodies inthe gift shop! It would be great to go into that pub in Germany – especially as Will is playing Mephistopheles this time. In his last exam, he played Faustus from Marlowe. He got a distinction for it, he got a distinction for his earlier Shakespeare – so we have to hope that Goethe is going to give him a hatrick. The exhibition sounds fantastic, it will have to be probably next year now unless I come into some money. Hope you have a good day at the library. http://en.wikipedia.org/wiki/Auerbachs_Keller is the English language link, if he wants to look up some info on Auerbachs Bierkeller before the exam (brownie points?) I keep my fingers and toes crossed for Will With regard to Dr Who Experience, the cunning plan was that you and Will stay with us, perhaps when one of the rooms is empty thanks to flatmate change or holidays. So you’d need your travel money, money for the Dr Who gift shop and entrance fees plus food. That would be fabulous – I’ll keep my fingers crossed for next year. I’ve never been to Cardiff even though I have been to Wales many times. The new Roath Lock BBC studios look amazing from the outside, the whole complex is huge. In a few years time every last bit of the old Harbour will be gone, methinks, and the whole area of Tiger Bay/Cardiff Bay will be one of the smartest and most exciting in the UK. You and Will are most welcome.